I always find events like DS6 stimulating and exciting. There are lots of good things about being your own boss, but one thing I miss about my former workplace is the interaction with other people doing a similar job. So festivals, conferences and events are the places where I am inspired and invigorated. Ideas flow, new contacts are made and I am challenged to take a fresh look at how I work. 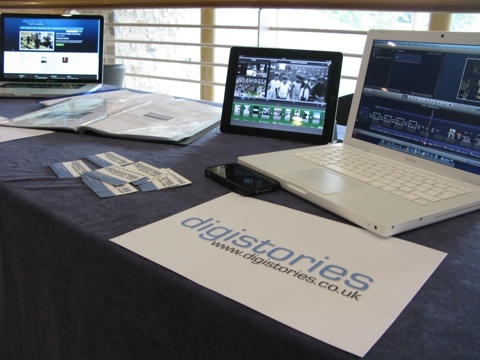 I have been showing people how to use iMovie on the iPad 2 to create digital stories as well as demonstrating how useful iMovie ’11 on the Mac has become. Lots of interest today in the service I offer and particularly the manuals I give to participants in the Training Trainers workshops. I promise now I will do some more work and make them available for download – for a small fee of course – as my own boss I have to generate my own income too. So as the organised part of the day at this digital storytelling festival draws to a close I’m looking forward to my last evening in Aberystwyth with Angeline and Aurelia before I return to York and they head home for Singapore via London. I just hope the restaurant I found last year is still open for business. For those of you who meant to make the time to be at DS6 – don’t miss out next year. Start planning now!